An icon of classic American design, famous for its brightness, quality, durability, and dependability, the Mini Maglite AA Incandescent flashlight is simple to operate, just twist the head to turn it on, turn it off or focus the spot-to-flood beam. The rugged, machined aluminum case is anodized inside and out for corrosion resistance and durability. The Mini Maglite AA flashlight is available blister packaged with a blue, black or camo flashlight and 2 AA alkaline batteries. 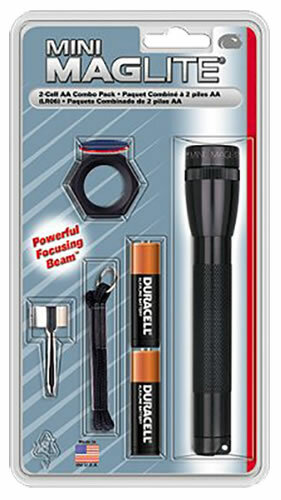 The black Mini Maglite AA is available as a light/accessory combo pack in a blister package including a black Mini Maglite flashlight, rubber anti-roll device, interchangeable lenses (red, blue and clear), pocket clip, wrist lanyard and 2 AA batteries.